In some parts of the country, fall is in the air. Not here in Florida where I live, but I feel it in my heart. It is my favorite season. I adore the colors of this months color challenge. Warm, cozy colors, just like Autumn. I decided to create a small vintage like mini album. I would like to fill it with pictures of butterflies and Autumn images to remind me that summer is fleeting, and fall is on the way. Here is your Lindys Color Challenge Palette. Gorgeous huh?? The entire mini is created from corrugated cardboard I saved from a heavy duty box. Save a tree!!! The cover and back were reinforced with chip board I saved from a paper pack at work. For my cover, I chose to spray the flowers with Lindys Starburst spray in Fuzzy Navel Peach. The leaves were sprayed with Flat Fabio Danny Zukos Denim. The metal frame was heat embossed using Cleopatra’s Copper embossing powder included in this months Limited Edition Color Challenge Mega Set. It gave my black metal a wonderful coppery sheen. Looks just like aged copper metal! I used 2 small metal clips, that I heat embossed to match my metal frame, and used a chain to attach the clips to. It is the perfect closure for mini’s. For the inside pages, I mounted paper onto the cardboard I used Prima’s Cartographer that was designed by my great friend Frank Garcia! The neutral papers compliment the colors in this months Color Challenge. I heat embossed spots with a mask and Lindys Cleopatra Copper Embossing powder. The die cut frames were also heat embossed with the same color powder. I inked the die cut cardboard with a walnut stain color before embossing. I sprayed the front and back with the Cowabunga Copper and edged each piece of the pages by painting on the same color using a small brush.Then I gave each page a quick spritz of Gag Me With a Spoon Gray Starburst Spray. That really gave the pages a fine metal like sheen. 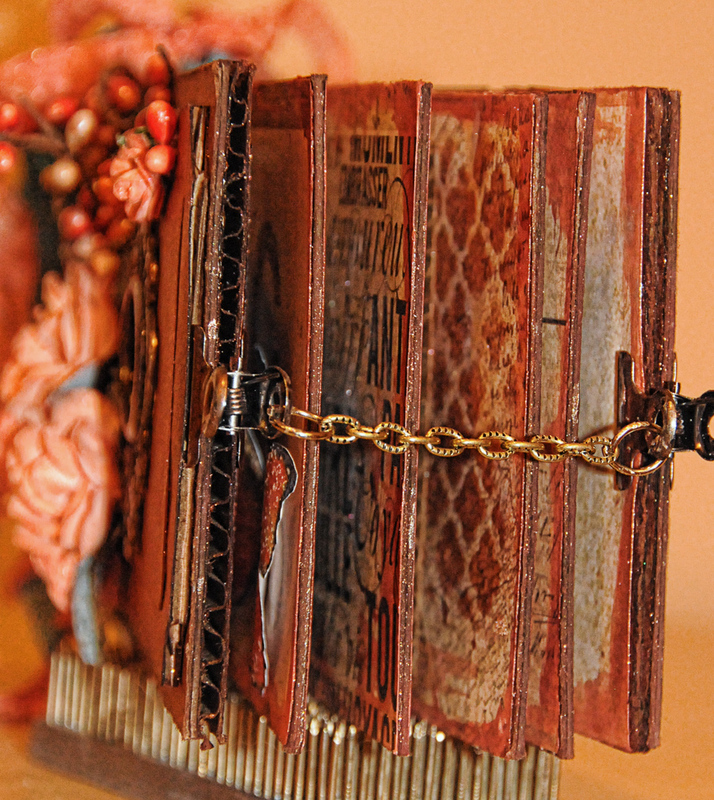 The spine of the mini was created using Grunge paper. I sprayed it with Cowabunga Copper Starburst Spray. 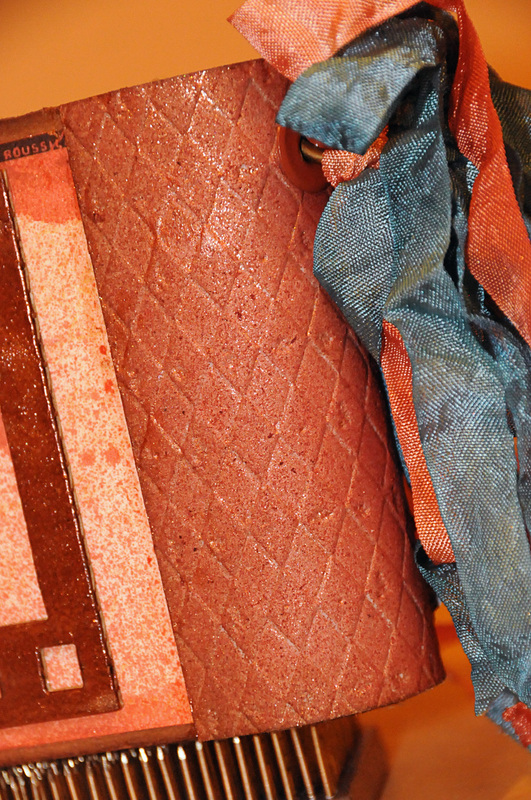 The seam binding was also sprayed with the Cowbunga Copper and Flat Fabio Danny Zuko’s Denim. I tied them to a ring on the spine. The back of the mini was finished with a heat embossed die cut as well. I seemed like the perfect ending to my mini. I wish you could see the sparkle and sheen the sprays gave each of the materials I used on my mini. The cardboard, the seam binding, the grunge board, the metal, to the fabric flowers. It is simply amazing what the sprays and embossing powders do to dress up a plain ordinary object. It turns it into something extraordinary. Thanks for coming by for peek. 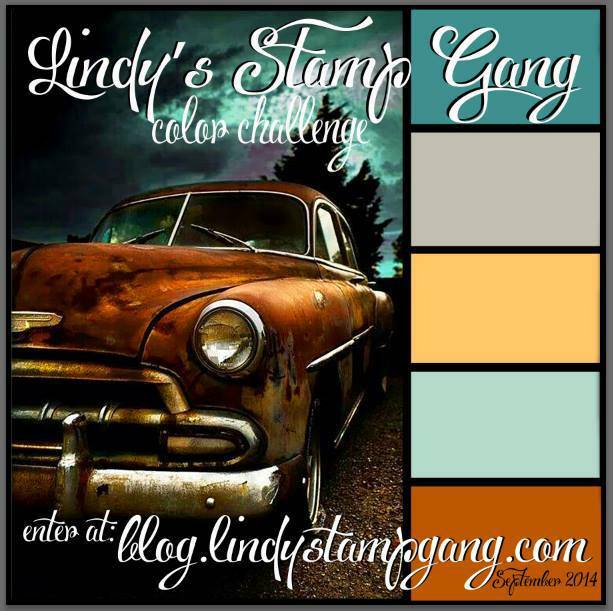 Don’t forget to join our September Color Challenge for chance to win some great Lindys product!! Amazing! That is one pretty album!! I love EVERYTHING about this gorgeous mini album! Thank you for the inspiration. I love copper color in most of my projects. I love the vintage feel.